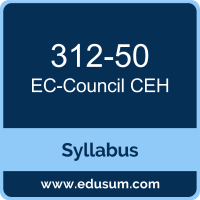 Use this quick start guide to collect all the information about EC-Council CEH (312-50) Certification exam. This study guide provides a list of objectives and resources that will help you prepare for items on the 312-50 EC-Council Certified Ethical Hacker exam. The Sample Questions will help you identify the type and difficulty level of the questions and the Practice Exams will make you familiar with the format and environment of an exam. You should refer this guide carefully before attempting your actual EC-Council CEH v10 certification exam. The EC-Council CEH certification is mainly targeted to those candidates who want to build their career in Cyber Security domain. The EC-Council Certified Ethical Hacker (CEH) exam verifies that the candidate possesses the fundamental knowledge and proven skills in the area of EC-Council CEH v10. To ensure success in EC-Council CEH v10 certification exam, we recommend authorized training course, practice test and hands-on experience to prepare for EC-Council Certified Ethical Hacker (312-50) exam.